Lord Chivas has been described by Judges as having the most beautiful handle. He has soft lustrous fleece. 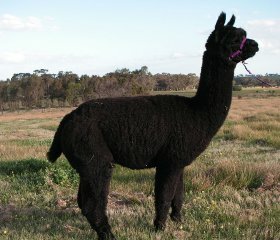 His black genetics are outstanding and we look forward to his first cria due in April 2010. Native has been successfully shown as a junior and adult and has been placed at the Nationals and Royal Melbourne. 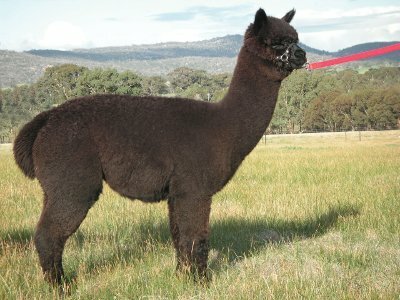 He has very fine, lustrous fleece with exceptionally soft handle. He three generations of black genetics in his background. We are very pleased with the cria he has produced to date. 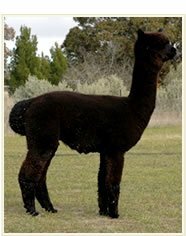 He has thrown solid black cria from tuxedo and mid fawn dams. 2008 Mean 24.2u sd 5.4 cv 22.2 cf 87.5 SF23.8. Sired by The Scud out of a Ruffo girl. He has the look which he puts into his cria . 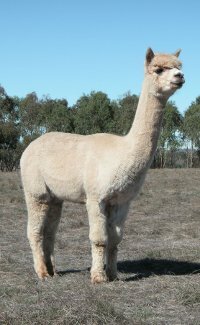 On a number of visits to Timbertop Alpacas this boy stood out and we just had to buy him! He is dense, has great coverage and confirmation. His fleece character is what we were searching for. Stud fee: $275 plus a further $275 if an A4 form is required. Is by Brigantine out of one of our an Inti girl). He has superior density and lustre and very little guard hair. His full brother is now working in Germany as an elite male. His 2006 4th fleece is holding very well. We are to use him over a number of our herd.